How To Build a 12' x 12' Stage | KaBOOM! A stage enhances the play area by giving children a place to put on skits and plays, and serves as a space to hold other community events as well. Do NOT cut the  2x6x12' boards. Set aside until you are ready to build. Take  of the 2x10x12' boards. Cut each down to 142", for a total of  2x10x142" pieces. Take  of the remaining 2x10x12' boards. Cut each down to 139", for a total of  2x10x139" pieces. Take the remaining 2x10x12' board. Cut down to  2x10x20 ¾" pieces and  2x10x22 ½" pieces. Take the 4x4x8' board. If the stage will be free-standing, cut down to  4x4x12" pieces. Leftover lumber can be used for another project. 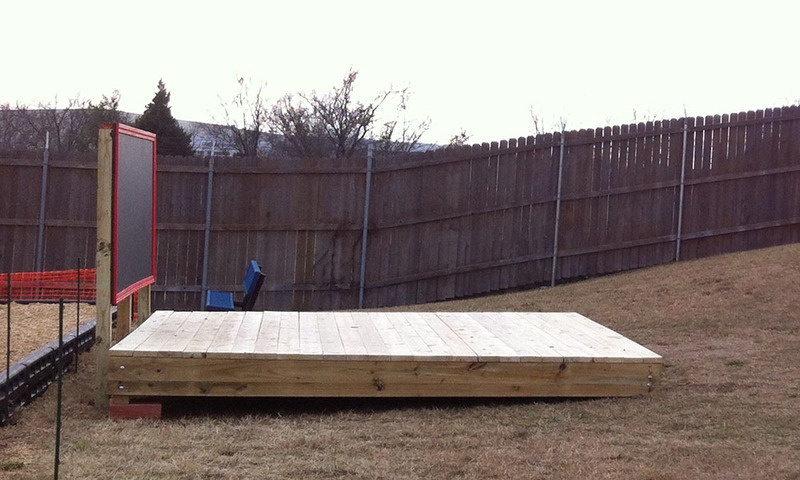 If the stage will be concreted into the ground, cut the 4x4x8' board down to  4x4x24" pieces. Start with one of the 2x10x139" pieces and two of the 4x4x12" OR 4x4x24"pieces. Use 2 screws at each end to attach the 2x10 to the 4x4s, so that both sides flush with the top. Then do the same with another 2x10x139" piece to the other two 4x4s. 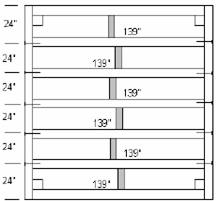 Next, use the 2x10x142" pieces to connect the two assembled sides, as shown in the diagram below. These longer 2x10s should run past the 4x4s and finish flush with the outside of the previously attached 2x10x139" pieces. Use three screws to attach one 2x10 to the other & attach to the 4x4 as well. Install the ½" carriage bolts, making sure to have the washers and nuts on the inside of the stage. Use  bolts for each 2x10 to 4x4 connection ( bolts through each 4x4). Make sure to stagger the bolts so that you don’t try to drill through one. Use the ½" drill bit to pilot these holes. Add the rest of the 2x10x139" pieces by fitting them between the 142" boards, making sure to set the tops flush on both sides. 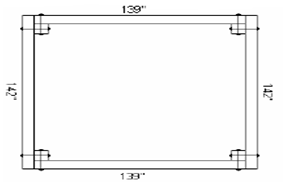 Space the 2x10x139" boards 24" center-to-center except at the ends: the first and last 2x10x139" should be 24" to the outside of the existing 2x10x139". Use a joist hanger and 1" Simpson nails at each connection as shown. Install the blocks between each of the 2x10x139" boards, making sure to keep all the tops flush. 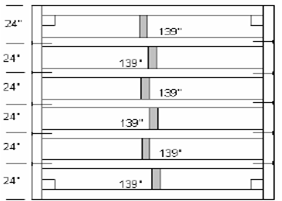 Use the 22½" blocks in the middle and the 20 ¾in blocks at the ends to maintain your 24" joist spacing. Use 3 screws for each connection. Run them in the middle of the 139" span, but offset them as shown to make it easier to screw them in. Attach the deck boards. Set the first 2x6x12' board parallel to the 2x10x142" piece and overhang it by 1 ¾" in both directions as shown. Secure the 2x6 by using 2 screws down into every 2x10x139" joist (the first and last 2x6 will be nailed down into the 2x10x142" pieces). 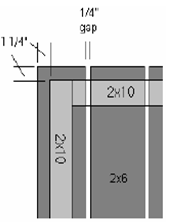 Place the next 2x6 next to the first, making sure to leave a ½" gap. 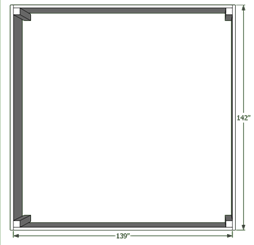 Continue across the stage - the last board should overhang the last 2x10 by the same 1 ¾". If you will be setting the stage in concrete, dig  holes that are 6" in diameter and 12" deep. Use a level to ensure that the stage stays level as you pour concrete into the holes around the legs.